The California man allegedly set up several social media accounts in the wake of last February's deadly tragedy. 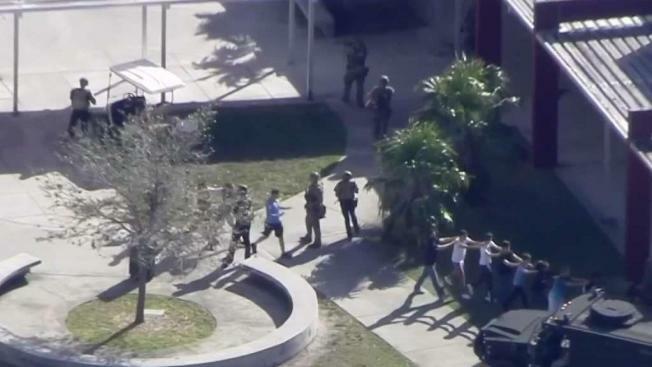 The FBI arrested a man from California who is accused of using Instagram to threaten, taunt and harass the relatives and friends of the victims who died in the Parkland school shooting, according to court documents. The criminal complaint obtained Tuesday by NBC 6 South Florida alleges that Brandon Fleury of Santa Ana, California, created numerous posts on Instagram through multiple accounts mentioning the handles of relatives and friends of the students who were killed in last February’s mass shooting at Marjory Stoneman Douglas High School. Between Dec. 22, 2018, and Jan. 11, 2019, Fleury allegedly tagged multiple people in taunting messages such as “Your grief is my joy,” “I gave them no mercy” and “I killed your loved ones hahaha” and even threatened to kidnap. FBI agents and law enforcement executed a search warrant on Jan. 16 at Fleury’s home after tracking down the IP address to an address in Santa Ana. During a post-Miranda interview, Fleury admitted to detectives to creating the Instagram profiles in an attempt to “troll” the victims, spark reactions and gain popularity, the complaint stated. Fleury also told detectives about his fascination with the confessed Parkland school shooter, other mass shooters and serial killers. He did not show remorse for the posts but told detectives he would not follow through on the threats. Fred Guttenberg, whose daughter Jaime died in the shooting, was one of the people who received the messages and told NBC 6 he was glad it was over. Fleury is being charged with using a computer or an electronic communication service with the intent to kidnap, harass and intimidate and to cause substantial emotional distress to a person. Attorney information for Fleury was not immediately available.